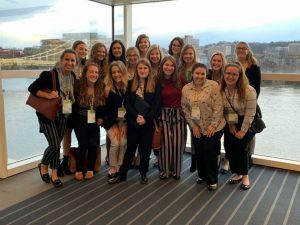 Students in The School of Hospitality Business at Michigan State University traveled to Pittsburgh, PA from January 6-9, 2019 to attend the Professional Convention Management Association’s (PCMA) Convening Leaders annual conference. The conference was held at the David L. Lawrence Convention Center. The overall theme of the conference was “Disrupt and Deliver.” The 17 students joined over 4,000 PCMA members from around the world who gathered to hear about the latest trends and technologies associated with convention management. All student attendees are members of the school’s PCMA student chapter, which was also named the 2019 Chapter of the Year by PCMA, nationwide. The MSU student chapter is advised by MiRan Kim, associate professor in the school. The PCMA student chapter will receive $1,000 from the PCMA Foundation to assist with educational, community service, and/or membership programs. The award is based on overall chapter leadership, academic excellence, community and campus involvement, and membership growth. Congratulations! In addition, PCMA chapter president, Sarah Michelson (BA ’20), received a tuition scholarship directly from the PCMA Foundation. Michelson shared some of her memorable moments at the conference by noting one of her favorite sessions was “Transforming Experiences into a Positive Force for Change.” A quote from speaker Steve Pemberton was most memorable: “Look back on the runway of life and say you swung away.” Pemberton grew up in a difficult foster home, but by taking chances and (swinging away) he was able to rise above and attend Boston College, where he is now on the Board of Trustees. Michelson also enjoyed the sessions, PCMA and Marriott on the Future of Events and Trending Now Studio. An interesting session some students attended discussed five important trends that could change the industry. The most interesting was the idea of “orchestrated serendipity” or the concept of “embracing the unexpected” to keep attendees engaged. The idea of intentionally canceling a breakout session to give attendees unexpected free time allows attendees to create new connections and break from the rigid structure of an event, and take time to process session content.